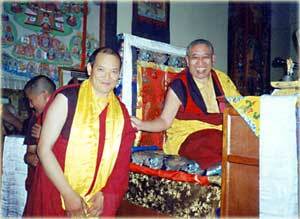 Lama Tashi och Thrangu Rinpoche. I want to thank you on behalf of the monks of Jigmenang monastery in Bhutan. Your help is greatly appreciated, - and is of great help to all the monks as well as the people living at the compound. 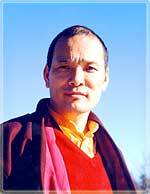 I want do to tell you that concerning their education it is well taken care of through Lama Tsewang Rapten. He is a well-trained teacher from the monastery of Thrangu in Nepal. 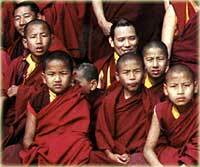 The young monks attend public school for three years and then continue at the monastery. In that area, about 25 km from the capital Thimphu it is not possible to go to school for more than three years. Unfortunately the roof of the monastery was old, - and it fell down last year, - but due to generous sponsors we are now able to make a new building beside the old one so that all can get an even better place to live and study. The monastery has already received permission to build as well. They still have a problem which is that the road up to the monastery, a mountain side is in such a bad shape that they need to renew it before they can get the material transported up the hill and they didn’t calculate on the road build. So it will all take a little longer time. Hopefully I am able to visit Sweden next year, hope to see you then.